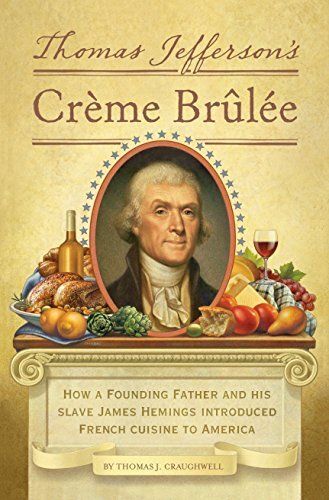 That Thomas Jefferson spent time in France is nothing new.There have been many books, movies, and mini-series to attest to that, but what is less well-known, at least to me before reading Thomas J. Craughwell’s delightful little book, Thomas Jefferson’s Crème Brulee, is the special attention he paid to food while he was there. I like to eat, mostly what my husband refers to as Oklahoma food, which is shorthand for white or yellow, bland, and most often made of wheat or corn. Some of my particular favorites are macaroni with just a little bit of tomato juice, corn bread, hominy, biscuits and gravy, and fried mush. In Jefferson’s day the American cuisine of the day was similar, simple foods prepared simply. But France? France was a wholly different place with wholly different ideas on how food should be prepared. There was nothing simple about it; food was designed to impress, and Thomas Jefferson wanted to bring that impressive food back to America when his 5-year stay was over. To do that he enlisted the help of his slave, James Hemings, who agreed to accompany Jefferson to Paris and learn to cook from the French in exchange for his freedom. Craughwell takes the opportunity in this concise, little book not only to relate the story of Jefferson and Heming’s agreement, but also to explore other interesting byways such as what Hemings status as an American slave was in a country where slavery was illegal and how did Sally Hemings,James’ sister and the eventual mother of several of Jefferson’s children, also find herself in Paris. 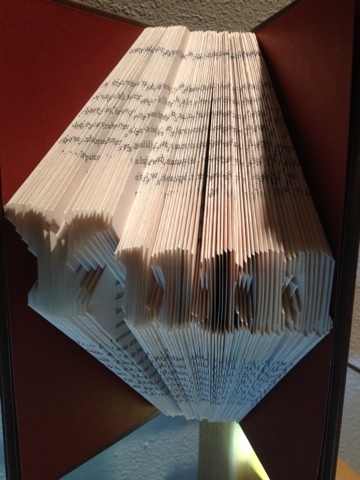 My favorite chapter was a description of a 3 ½-month trip that Jefferson took throughout France and eventually into Italy in order to sample foods and wines and record the status of the peasantry he encountered along the way. The American experiment at the time was in its very infancy and Jefferson was determined that his country emulate the best of what he found and avoid the worst. I enjoyed this book, most of which concentrates on Jefferson,which is understandable since documented sources about him are much more plentiful than those on Hemings. Craughwell himself bemoans the fact that we don’t know more about Hemings, and I, too, found myself wishing I knew how he felt about living in a country where he did not speak the language while learning an rigorous new skill, the successful completion of which would mean his freedom. One can only imagine.